With the advent of WebRTC and the increasing capacity of browsers to handle peer-to-peer communications in real time, it’s easier than ever to build real-time applications. 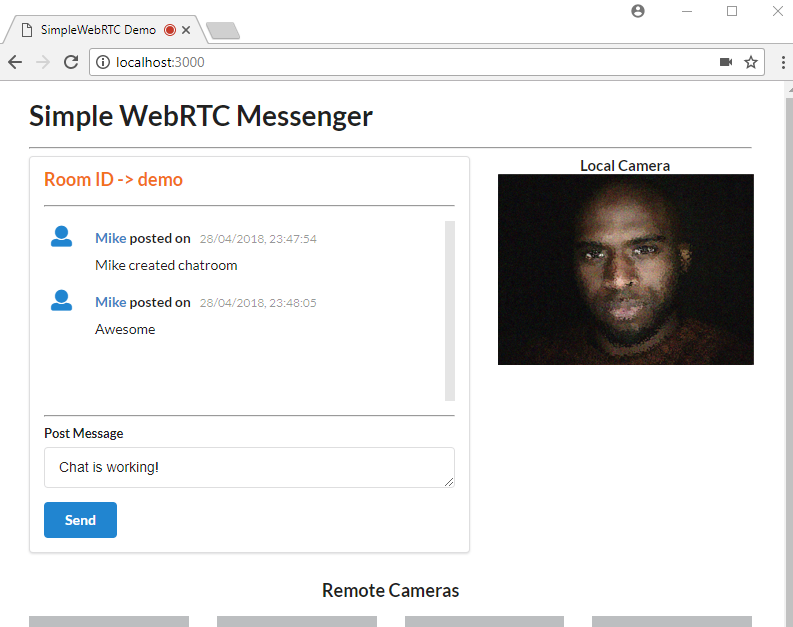 In this tutorial, we’ll take a look at SimpleWebRTC and how it can make our lives easier when implementing WebRTC. Throughout the article, we’ll be building a WebRTC video chat app with messaging features. If you need a bit of a background regarding WebRTC and peer-to-peer communication, I recommend reading The Dawn of WebRTC and Introduction to the getUserMedia API. SimpleWebRTC acts as a wrapper around the browser’s WebRTC implementation. As you might already know, browser vendors don’t exactly agree on a single way of implementing different features, which means that for every browser there’s a different implementation for WebRTC. As the developer, you’d have to write different code for every browser you plan to support. SimpleWebRT acts as the wrapper for that code. The API that it exposes is easy to use and understand, which makes it a really great candidate for implementing cross-browser WebRTC. Now it’s time to get our hands dirty by building the app. We’ll build a single page application that runs on top of an Express server. You also need a PC or laptop that has a webcam. If not, you’ll need to get yourself a USB webcam that you can attach to the top of your monitor. You’ll probably need a friend or a second device to test remote connections. 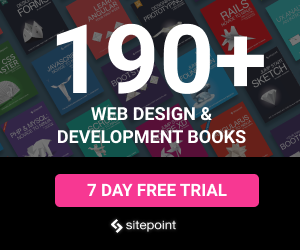 jQuery — used for selecting elements on the page and event handling. 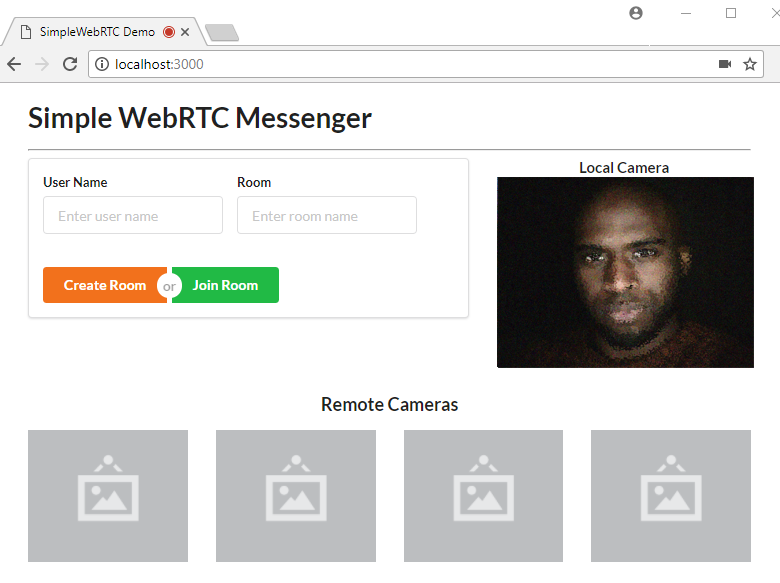 A tutorial on building a WebRTC video chat app using SimpleWebRTC. The server code is pretty standard. Just read the comments to understand what’s going on. Finally, download this image from our GitHub repository and save it inside the public/images folder. We’re using a blank image as a placeholder to indicate where the camera location will stream to on the web page. Take note that this app will be able to support multiple remote connections, provided your internet bandwidth can handle it. Now let’s add the three Handlebar templates that will make our web page interactive. Here we’re initializing several elements that we plan to manipulate. We’ve also added validation rules to the form so that a user can’t leave either of the fields blank. 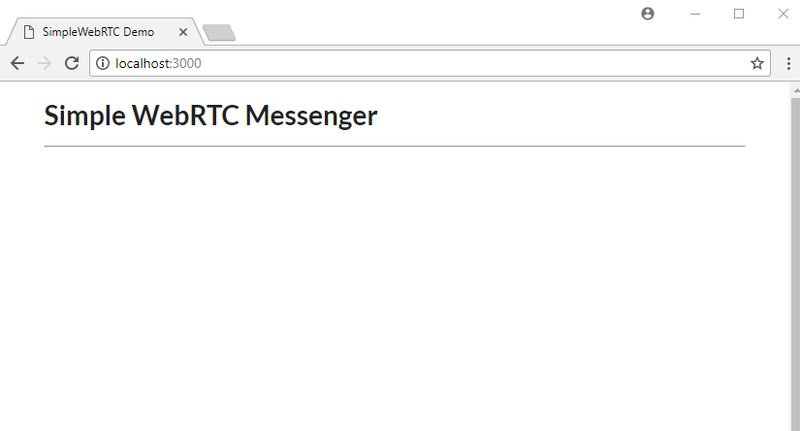 Now you know why it’s called SimpleWebRTC. That’s all we need to do to initialize our WebRTC code. Noticed we haven’t even specified any ICE servers or STUN servers. It just works. However, you can use other TURN services such as Xirsys. You’ll need to set up a local SignalMaster server for handling WebRTC signaling. The page should request access to your camera and microphone. Just click Accept and you should get the above view. 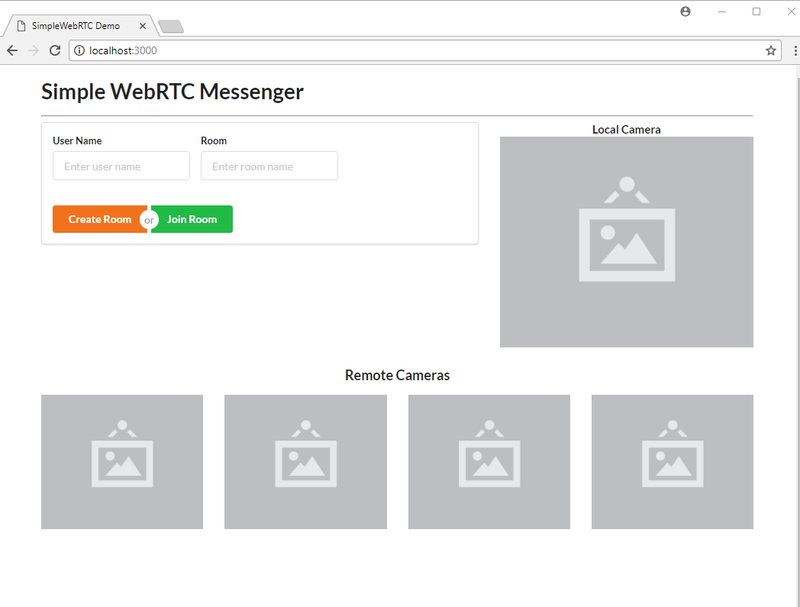 Creating or joining a room is a simple as that: just use SimpleWebRTC’s createRoom and joinRoom methods. Hit the Create Room button. You’ll be taken to this view. Post some messages to confirm the chat room is working. Once you’ve confirmed it’s working, move on to the next task. That’s it. I’m sorry if you were expecting something more complicated. What we did is simply add an event listener for videoAdded, the callback of which receives a video element that can be directly add to the DOM. It also receives a peer object that contains useful information about our peer connection, but in this case, we’re only interested in the DOM element’s ID. Unfortunately, testing this bit of code isn’t possible without running it on an HTTPS server. Theoretically, you can generate a self-signed certificate for your Express server in order to run the app within your internal network. But the bad news is that browsers won’t allow you to access the webcam if the certificate isn’t from a trusted authority. The simplest solution to testing the above code is to deploy it to a public server that supports the HTTPS protocol. This method that we’re about to perform is one of the easiest ways to deploy a NodeJS app. All we have to do is first register an account with now.sh. If this is the first time you’re running the command, you’ll be asked to enter your email address. You’ll then receive an email that you’ll need in order to verify your login. After verification has been done, you’ll need to execute the command now --public again. After a few seconds, your app will be up and running at a specified URL that will be printed out on the terminal. If you’re using the VSCode integrated terminal, simply press ALT and click to open the URL in your browser. You’ll need to allow the page to access your camera and microphone. Next create a room just like before. After you’ve signed in, you need to access another device — such as another laptop or smartphone with a front-facing camera. You could also ask a friend with an internet connection to help you with this. Simply access the same URL, and enter a new username and the same room name. The remote user will have to hit the Join Room button. Within a few seconds, both devices should be connected to the chat room. If a device doesn’t have a camera, that’s okay, as the chat functionality will still work. 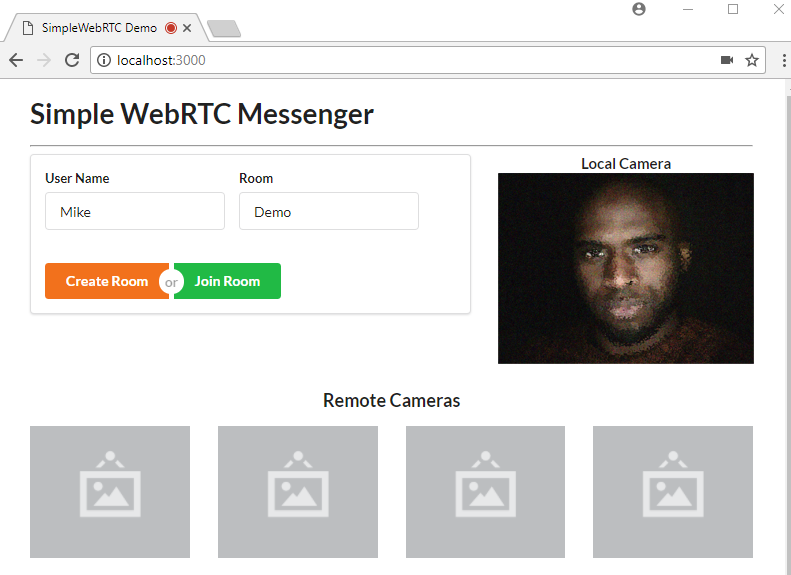 In this tutorial, you’ve learned about SimpleWebRTC and how you can use it to create real-time apps. Specifically we’ve created a messaging application that allows the user to send text and make a video call to a remote peer. 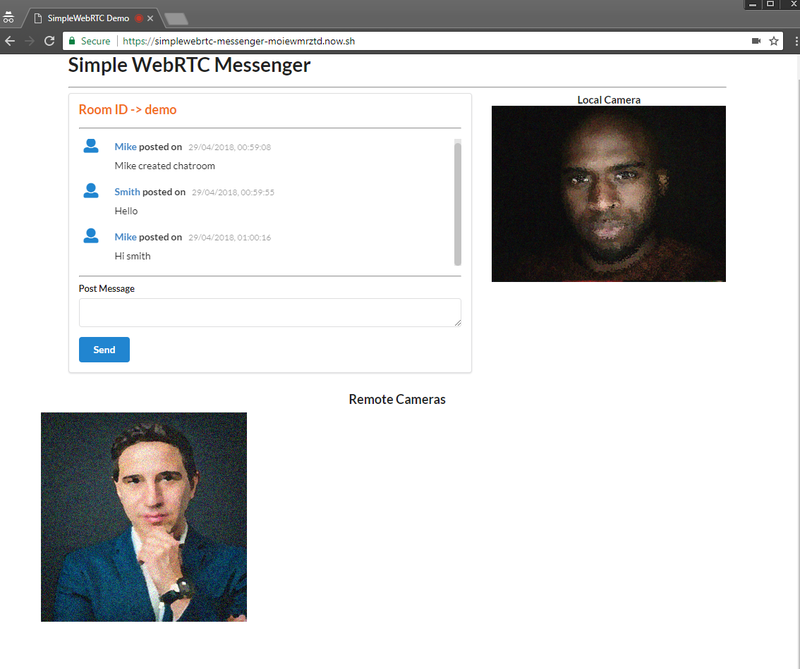 SimpleWebRTC is a really great cross-browser library for painlessly implementing WebRTC in web applications. Don’t forget that the code used in this tutorial is available on GitHub. Clone it, make something cool, and have fun!